Saturday, April 16th, dawned blue with a foot of cold smoke for the taking off Lone Peak, effectively parting the sea on the resort's busiest day of the season between the diehard skiers and the diehard partiers. It remains to be seen whether this year's event produced another viral moment like the above. Resort officials wisely bumped the start time up by about four hours, which effectively toned down the debauchery and haggardness compared to previous years. However, pond skimmers kept up their end of the bargain and provided plenty of entertainment to a massive crowd of onlookers thirsty for carnage. The Pond Skimming World Cup is coming to Sunshine Village, Alberta, on May 23. Learn more here. Gwyn Havlik, 13, from Missoula, Montana, face planted to a double-e and waded back in the knee-deep water to retrieve her lost ski. Cole Thorne and Shannon Corsi skimmed as a duo wearing black unitards and rabbit ears, inspired by the dancing twins emoji, reserved for only the friskiest of text messages. Upon slapping the water, one girl's unitard ripped apart at the crotch and revealed a bit of skin. (Don't worry, folks, things stayed PG-13). A pair of 6-year-old twins dressed as superheroes stopped dead in their tracks with an exaggerated pizza just before skiing into the pond, side-eyeing the water with an expression of sheer doubt and suspicion, clearly questioning the sanity of the adults around them. They were, as MC Brandon Bang put it, "the cutest thing I've ever seen." The crowd roared; the girls skied to their mom on the sidelines. 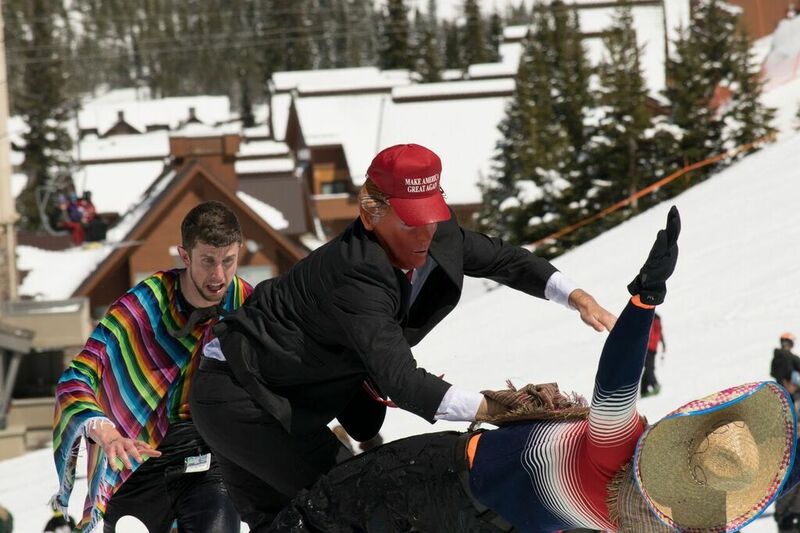 Even Donald Trump made an appearance to Make Pond Skimming Great Again via Jimmy Evans, 34, of Bozeman, Montana. Melania Trump (Hope Evans, 26) skimmed next. Then Trump’s wall (Brianna Hobbs, 34) came crashing down, skiing down hot with enough speed to skim to the second pool before drowning to oblivion, much to the great delight of the cheering crowd. The presidential debate really didn't get started, however, until two banditos (Will Ballew, 28, and Steven Hodge, 33) chased the wall and skimmed the pond to attack Trump. The juniors skimmed first, ages 6 to 17, er, plus one 35-year-old man who cheated the registration. Then the "adults" competed. The course, held on the groomer under the Ramcharger chair, was a bank turn to a double-staged pool. Floaties and beach balls added to the challenge, forcing skiers to skirt random obstacles bobbing in the water. Tyson Patterson, 22, from Great Falls, Montana, approached the floaties with a different strategy: pierce beach ball with the tip of the ski and proceed to deflate. Speaking of strategy, after wiping out, Mike Desjarlais, the "hippy," gave the following insightful advice for aspiring pond skimmers: "Try not to wipe out." This was not Desjarlais' first pond skim, though he admits, the bank turn took the wind out of his sails. "The key is to cut that turn and keep your speed up," he said. Most did not heed Desjarlais' advice, especially the snowboarders, which, let’s face it, are facing a disadvantage straight out of the gate based on lesser equipment with one plank instead of two. Chelsea Conway, 26, of Rochester, New York, lost speed as soon as she hit the water and unlike the penguins she channeled with her costume, sank immediately. Another penguin, Mike Boucher, 37, only made it half way. Matthew Baumgardner, 25, of Bozeman, reached for it, literally. His arms were outstretched from the beginning to the end. He deftly hopped across the beach balls, but alas, lost his speed in the second pool. Tyler Esposito, 23, of Bozeman, speed checked and never recovered. He caught his rear edge and back-slapped on the water. Next up was Ryan Johnson, 24, from Duluth, Minnesota, who showed up representing the "spirit of Spring Break." Johnston skied so fast you probably missed him altogether if you weren't paying attention. He skimmed the first pool, skimmed the second, and exited the far end of the pond with a clean front flip before skiing away and out the gate. Johnson won the event, and thereby qualified for a chance to win the coveted Slush Cup at the Pond Skimming World Championships on May 23rd at Sunshine Village, Alberta. But he was too busy getting down with Spring Break at the Huntley and probably still doesn't even know he won the entire competition. (Have you seen Johnston? Please tell him to email the marketing department at Big Sky, stat.) Roberta Shelly, 23, of La Crosse, Wisconsin, channeled her inner Lois Lane and took the win for the ladies. And that's a wrap on the 13th annual Big Sky Pond Skim in Montana. Stay tuned for more debauchery at the fourth and final qualifying stop for the Slush Cup—the Cushing Classic at Squaw Valley. For more information on the Pond Skimming World Cup, click here.